Forrest Carter (1925)...Book "Gone To Texas"
By the time of our country’s bi-centennial in 1976, modern day life was close to one hundred years removed from the antiquity and lifestyle of the pioneers. Adults and children who had been spoon fed an overabundance of westerns on television in the 50’s and 60’s, now entered a decade that would be highlighted by mass marketing, gas lines at the pump and the resignation of a president. The country was growing up very fast and film westerns were beginning to show their age too. After decades of serial B-westerns and the hokum that was most evident in John Wayne’s later films, the movie-going public was starting to criticize these movies as corny and passé. A few directors such as Sergio Leone and Arthur Penn had brought about fresh interpretations by using either an anti-hero as the main character, or told their story from the aspect of the Native Americans. While both of these approaches were new and refreshing and would momentarily breathe new life into the genre, the film western was on life support. With the success of Jaws in 1975, most Hollywood actors, directors and producers were ready to give the film western its last rights, that is, all but Clint Eastwood. Having made his name in Sergio Leone’s trilogy of spaghetti westerns A Fistful of Dollars, For a Few Dollars More and The Good, the Bad and the Ugly, and still fresh off the success of the crime drama Dirty Harry, Eastwood now had enough clout to convince studio executives that he had a fresh idea to re-invigorate the dying genre. By combining aspects of both Penn’s and Leone’s work he would create a film that would leave an indelible mark on the landscape of film westerns. 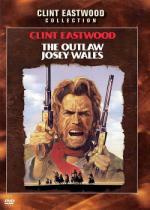 The Outlaw Josey Wales is set in the post-Civil War west, as Josey Wales (Eastwood) is the sole remaining ‘rebel outlaw’ of ‘Bloody’ Bill Anderson’s Missouri raiders still at large. The viewer learns in the beginning of the film that Wales was a peaceful homesteader at the start of the war, but when his family is massacred by an over-zealous group of Union cavalry, he joins Anderson’s band in hopes of tracking down his family’s killers. When the war ends and an amnesty is offered to all rebel guerrilla’s still fighting in Kansas, Wales is the lone holdout from Anderson’s group and witnesses his comrades ambush executions, led by the man (Bill Kinney) who had also murdered his family. As the story unfolds, Wales will play a game of cat and mouse with his pursuers, all the while assembling a small band of refugees who see in Wales an amalgam of prophet, warrior and tortured soul. It is in this communal assembly that Wales’ transgressions in the past, are seen in their true light by the viewer as a man willing to do anything to survive, but still live life by his own will. From a financial and critical standpoint, The Outlaw Josey Wales would be Eastwood’s most successful western up to that time, and would only be supplanted many years later with his release of Unforgiven. It is hard to imagine that Eastwood had only been directing feature films for a scant five years as the pacing, framing and cinematography of this film, would have done such artistic directors such as George Stevens and William Wyler proud. If you love a good shoot ‘em up western, then this might not fit the bill, but if you like your films to be entertaining, engrossing and visually breathtaking then give this one a chance, you’ll be pleasantly satisfied with the outcome. Thanks, will consider this by placing it on my Wish List.